Portrait paintings by Chanit Roston. Invest in love: the only lasting value. What a wonderful, unique gift a portrait by Chanit would make. It is a lasting gift of love. 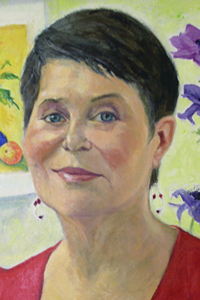 Chanit is offering to paint a portrait of you or your loved ones, anyone on your list. The price is right — it will bring great delight. Your choice of oil or watercolor. Ideally, Chanit prefers to work from live sittings. If this is not possible, she will be happy to paint the portrait of your choice from photographs. 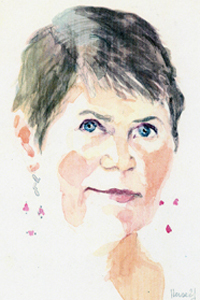 Have Chanit paint watercolor portrait sketches live, on the spot in 15-30 minutes to add magical excitement to your next special event, public fund-raiser or private gala. 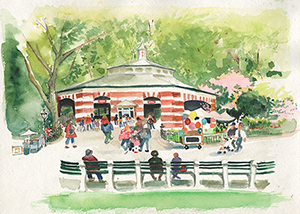 Chanit and Pamela King have created two art books for ageless children, showcasing 30 luminous watercolors by Chanit of the loved, majestic places in Central Park, with text by Pamela. Help publish these two exciting new Art Books -- When I Go to Central Park and Come to Central Park -- for children of all ages on high quality offset printing. Click to http://www.cometocentralpark.com to take a tour and place your orders. Yes You Can unique ongoing watercolor classes are being offered by Chanit every Monday afternoon. Beginner students and advanced painters will be encouraged to find their own special way to see and paint. Reservations are requested for class participation — new location: East Side Midtown Manhattan, in Grand Central Station vicinity. See Chanit's Gallery of paintings for sale: Energy Works dazzling display of abstract oil paintings on linen canvas; and beautiful Floral and Favorite Things to brighten your quarters. Many more original paintings by Chanit are for sale. Prices upon request. Current Barebrush N*des postings by Chanit can be viewed at her featured-artist page http:// barebrush.com/ featured.php ?artist_id=14. These original oil and watercolor paintings by Chanit are for sale. Watercolors range from $200 to $700; prices for individual oil paintings are available upon request. Note: POP-UP window links are for convenient, quick reference. You can drag corner to enlarge POP window and/or use keyboard PageDown/PageUp and arrow keys to navigate. Your computer shows TODAY is: . ENJOY! Ahem! Excuse us . . . if you see this message, your browser does not support Cascading Style Sheets. This site uses CSS.